Will Low-Income Folks Be Hit Harder By Global Warming in the Pacific Northwest? Global warming in our region will degrade the lives of low-income folks more than those with greater economic resources. I go to a lot of regional climate policy gatherings and this claim has been accepted wisdom by many environmental activists, with nodding approval when stated. And this assumption is driving all kinds of actions, like inspiring some activists to oppose the carbon-tax initiative (I-732) because it doesn't provide enough support for low-incoming and minority folks. 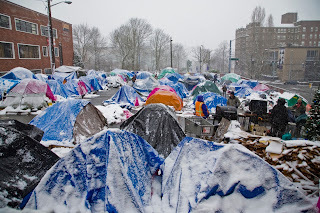 This blog asks the question directly: Is it really true that global warming's effects in the Northwest will hit poor individuals more than others? My analysis suggests that there is no basis for this assumption and that it serves as a" convenient truth" for those with agendas beyond the environment. Let us begin by asking what is the number one weather phenomenon that kills and injures Washington State residents and particularly poorer ones. Is it windstorms, floods, smoke from wildfires, or thunderstorms? 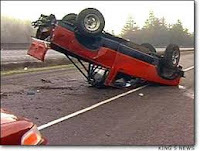 No, it is clear that it is ice on roadways (a.k.a black ice), something I have blogged about many times in the past (and I have had a project with WSDOT to deal with it). I have testified in many legal cases on this topic, and a large number of those injured have been low-income folks, who are particularly vulnerable. Many of them ride long-distances to jobs in all kinds of weather and they often have cars without the latest safety features. Less well off folks often have longer commutes because they can't afford expensive homes near the central cities. A warming climate associated with increasing greenhouse gases will reduce snowfall over the Pacific Northwest, with increasing temperatures substantially reducing the frequency of "black ice" on roadways. Conclusion: warming temperatures reduce ice on the roadways, which will preferentially aid low income folks for the most dangerous meteorological threat facing them. One of the key threats to our region from global warming associated with increasing greenhouse gases is heavier precipitation and flooding. My colleagues and I have done a lot of research on this topic using global and regional models, and the conclusions are emphatic: by the end of the century extreme precipitation will be enhanced, and coupled with less snowpack, flooding--particularly in the fall-- will be enhanced. Homes along rivers will experience increasing flooding. I would suggest that there is no reason to expect that poor folks live preferentially along rivers. In fact, the opposite is probably true: water and river view is a premium experience, with land along rivers costing a premium. If you want proof of this, check any real-estate site like Zillow. If anything, flooding will preferentially affect richer folks. is threatened by increases in precipitation under global warming. I wouldn't. Conclusion: Thousands of waterfront homes in our region are threatened by global warming, but there is no reason to believe that poorer folks are preferentially threatened. The opposite is probably the case. And the same is true for rich farmland (such as the Snoqualmie Valley) that will experience more flooding. Heavier precipitation under global warming will increase the frequency and intensity of slope failures in our region. 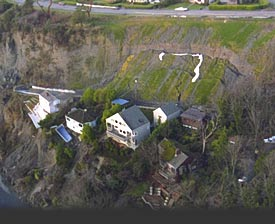 Particularly vulnerable homes are at the tops or mid-slopes of the inclines extending from Puget Sound. These prime view locations are preferentially owned by wealthy folks, such as the famed Perkin's Lane in Seattle, which has experienced repeated slope failures during heavy rain events. Conclusion: Landslides and slope failures, a major potential impact of global warming, will preferentially harm rich and well-to-do folks. As the earth warms, regional sea level will rise, with the exception of portions of the northwest Olympics Peninsula that are still rebounding from the loss of ice after the last ice age. Estimates range from 1-2 feet by the the end of this century. Those living along the water will be particularly vulnerable. As can be easily determined by using a real-estate web site (like Zillow) or a map of incomes around our region (see below), folks along the water tend to be considerably richer than those living inland. Conclusion: the impacts of sea-level rise will preferentially hit wealthier folks. It has been suggested that increasing temperatures under global warming will increase the threat of wildfires. This suggestion is based on the assumption that we won't deal with the real issues (like the mismanagement of the forests and letting folks live in forests that have frequently burned for millennia). But lets accept that the number of wildfires will increase. Will poor folks be preferentially harmed by these increased wildfires? 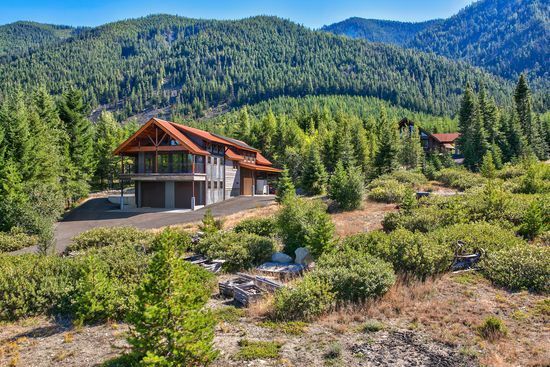 As someone who has spent a lot of time exploring the eastern slopes of the Cascades, I have noted that many of the houses in the most vulnerable locations are vacation homes and residences of relatively well-to-do retirees. Check out the real-estate site and you will not believe the expensive homes being built in the most vulnerable locations (see image below). Poorer folks generally don't live in these vulnerable forest mansions. There is a lot of agriculture along the eastern slopes, and some orchards or vineyards could be vulnerable to increased fires as the region warms. These agricultural properties (and fruit processing facilities) are preferentially owned by relatively well to do farmers and investors. On the other hand, after a vineyard is burned, there might less jobs for agricultural workers initially. But perhaps more work later restoring the land (e.g. replanting). What about wildfire smoke and health impacts? Would lower-income or minority folks suffer more? There is no reason to expect this. Wildfire smoke spreads rapidly, influencing large numbers of people and many towns/cities (such as the smoke the hit both Spokane and Seattle last year). All will suffer. Conclusion: Increases in wildfires will affect wealthier individuals as much or more than lower income folks in terms of loss of property. Health effects from smoke will influence all groups. Finally, let us consider heat waves, which will surely increase due to global warming. Richer folks will have more access to air conditioning and thus will more opportunity to escape unpleasant warmth. An important question is whether lower-income folks will have more heat-related health issues and morbidity than their richer neighbors? Although there may be some class-related effects here, I suspect they will be minor due to the meteorology of our region. Unlike the eastern U.S, Northwest heat waves are accompanied by relative low humidities. The reason, strangely enough is the cool Pacific Ocean (which ensures dew points are low) and desert-like conditions of the interior west. As a result, sweating is very effective here, compared to high-humidity region east of the Rockies. Furthermore, the dry air allows effective cooling at night on both sides of the Cascades. So it might be 90-100F during the day, but temperatures drop to the 50s or 60s at night. A plot of the temperatures at Pasco for the past four weeks illustrates this. With effective skin evaporation and cooling at night, heat exhaustion and deaths are rare in our region, even with very hot weather. And folks in western Washington can get relief from heat by heading to the water, which is always cool here (I notice that many flock to Puget Sound and Lake Washington beaches during hot periods). To prove the above, here is a plot of heat-stress hospitalizations for Washington State (per million people). The highest was in 2009 during our historic heat wave (when many all-time records were observed). During that year the rate was annual heat exhaustion rate hit 15 per million (so about 100 in the State for entire year). Heat-related deaths were far less. Roughly 7 in the 2009. Perhaps of that 7, there was some preference for low-income folks, with the elderly being the most vulnerable. But not a major source of mortality in our region and our low summer humidities will continue under global warming. Conclusion: Heat waves should increase and one can expect some increase in heat exhaustion/heat deaths. But this is a very small threat to the population of our region due to our meteorology and proximity to water. Eastern WA agriculture should be enhanced by global warming. Unlike California, there should be plenty of water in our future, particularly if additional reservoirs are built (Northwest rainfall will be modestly greater with global warming). Already California firms are buying up agricultural land and the number of acres in vineyards has risen substantially. As CA become warmer and drier, there will be a huge potential for agricultural expansion in eastern Washington from those picking fruit and those working in the packing and shipping industries. Thus, employment and wages should grow substantially. 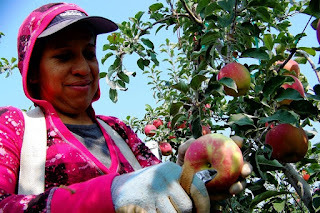 Since agricultural workers are predominant low income and minority folks, they can look forward to improve economic opportunities as a result of global warming. Cold waves and hyperthermia are potent threats to even young homeless people as documented extensively. By the end of the century, winter temperatures will be substantially higher than today (5-8F) and thus the threat of hyperthermia should be substantially lessened. Warmer temperatures during the summer will be unpleasant but generally not life threatening for those living outside. There is no expectation of more extreme storms in our area. 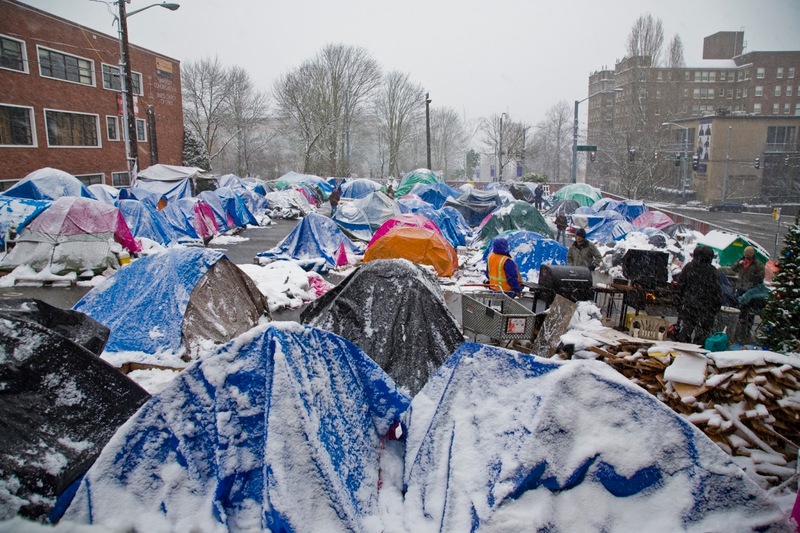 Substantially warmer temperatures and a sharp drop in the frequency of lowland snow brought be global warming will be of considerable benefit to homeless folks living outside. In poorer rural communities there is substantial dependence on burning wood for heat. Such wood smoke is an acute health risk, contributing to asthmatic symptoms, lung cancer, and heart disease. With substantial warming by the end of the century, heating requirements will be reduced, thus lessening the need to burn wood. Richer households tend to use natural gas or electricity for heating, and thus enjoy less exposure to noxious wood smoke. Conclusion: Warming will result in less wood smoke, which should have preferential benefits for poorer communities. Considering all the expected changes in the Northwest climate that will occur under global warming (and some will be large), there is NO reason to expect that global warming will have more overall negative impact on low-income or minority individuals. In fact, one could easily make the opposite case: that warming will preferentially degrade the lives of richer folks. Thus, the Alliance for Jobs and Clean Energy, Seattle's Climate Solutions, some Democratic activists, and other "progressive" groups that are making this claim (that poor folks will experience great impacts) are doing so without any real evidence of its validity. Using this false assumption, they are opposing important advances in saving our planet and the environment, such as the I-732 revenue-neutral carbon tax initiative. It appears that their social agendas (increasing government budgets for interventions to aid low-income groups) are more important than their commitment to the environment. Aiding our less advantaged citizens is important, but that is a separate issue. But groups like the Alliance are willing to sacrifice critical environmental progress and any hope of bipartisan environmental action for their political goals. Regarding I-732, the opposition of some groups is particularly surprising, consider that this initiative would reduce the sales tax by 1%, a boon to low-income folks in a state with a highly-regressive tax structure, as well as a tax rebate for working families that would neutralize their extra fuel costs. It is time for them to reevaluate their positions and lend support to measures such as I-732 that will encourage a move to a less carbon-intensive economy. The key point: ALL of us in the Northwest are going to be affected by global warming, and all of us must work to reduce greenhouse gas emissions and prepare our society to adapt. Those trying to divide us (like the Alliance for Jobs and Clean Energy) are greatly undermining progress. This blog is only talking about the effects of global warming in our region. My point is that in the Northwest the effects of global warming do not preferentially hit poor people or minorities. We are all in this together. Since I-732 ONLY deals with Washington State, only effects in our region are relevant. Even those wanting to create a non revenue-neutral carbon tax, would only spend the money in WA (they are not going tax Washingtonians and give the money to the underprivileged in California). Of course, global warming will preferentially affect poor folks outside of our region (e.g., the Sahel)...no one is arguing about that. But that is not relevant to a Washington State carbon tax. During the evening of September 28, I will be giving talk in Seattle at UW's Kane Hall on Climate Surprise: Unexpected Impacts of Global Warming on the Pacific Northwest. This will be a new talk, based on the latest research, that will describe some regional "climate surprises" that may well occur in our region during the next century. This talk is sponsored by CarbonWa and the Audubon Society To find out more or to secure tickets, please go here. During most summers it happens around this time: the first major transition to cooler temperatures. Generally, during the third or fourth week of August, a strengthened jet stream undulates southward over us, bringing much cooler temperatures and some light showers. And this year is no different. But we have one more day of very warm temperatures reaching into the 90s on Friday, before the weekend transition begins. Yesterday (Thursday) was quite toasty west of the Cascade crest, with temperatures reaching the 90s as far north as central Puget Sound. 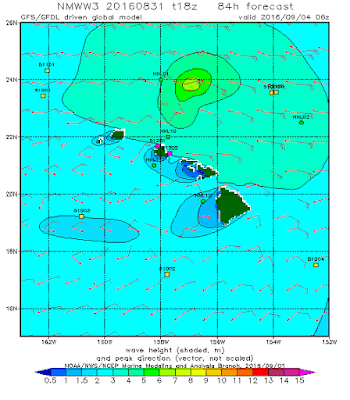 Even the coast was warm as a result of general easterly flow aloft. With high pressure still dominating the region, tomorrow should be equally as warm away from the coast, so don't thrown away the sunscreen and sunhat yet. The UW WRF model forecast of surface temperature fro 5 PM Friday shows warm temperature over the western interior, but if you look closely you can see the onset of onshore flow, that will begin the cooling process on the coast before it spreads inland Saturday. Over the weekend, the ridge of high pressure will move westward, with a series of troughs (low pressure) over increasing amplitude pushing into our neighborhood. Let me show you using a series of upper level (500 hPa, about 18,000 ft) maps. Thursday at 5 PM. BIG RIDGE over the eastern Pacific. Saturday at 11 AM PDT, a sharp trough is pushing towards us from British Columbia. 5 AM Friday. WOW. Very deep low right off our coast. A feature this strong will bring rain back to the Northwest. Here is the 72hr total precipitation ending 5 AM Friday. Light to moderate totals over western WA and Oregon. More in BC. The Climate Prediction Center's 6-10 day forecast is going for below normal temperatures and above normal precipitation. So enjoy today's warmth and sun and be prepared for a progressive cool down to below normal temperatures by Sunday, extending into next week. You might want to find that sweatshirt and umbrella that are gathering dust in the corner. It is not often that a measure comes before the public that is wise, bipartisan, environmentally progressive, and helps address income inequalities in our State. A measure of such immense promise that it could have profound, and very positive, impacts both in Washington State and around the nation. What am I am talking about? 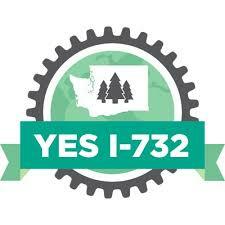 Initiative I-732, the revenue-neutral carbon tax that will be put to Washington State voters in November. The key idea is to tax something that we don't want (carbon emissions into the atmosphere), using the money to make our State tax structure more fair and less regressive (mainly by reducing the State sales tax). Why don't we want more carbon in the atmosphere? Because it is clear that increasing CO2 will lead to a much warmer atmosphere and a number of environmental disruptions. For all the talk about climate change, mankind is doing very little to stop global warming. Don't believe me? 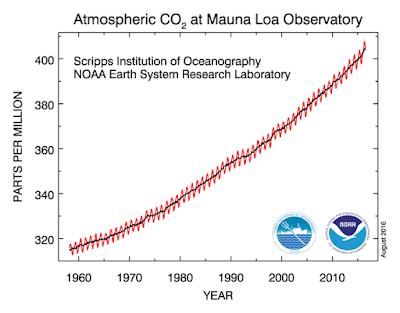 Here is a plot of CO2 concentrations in the atmosphere for the past half-century. You see much progress? I don't. 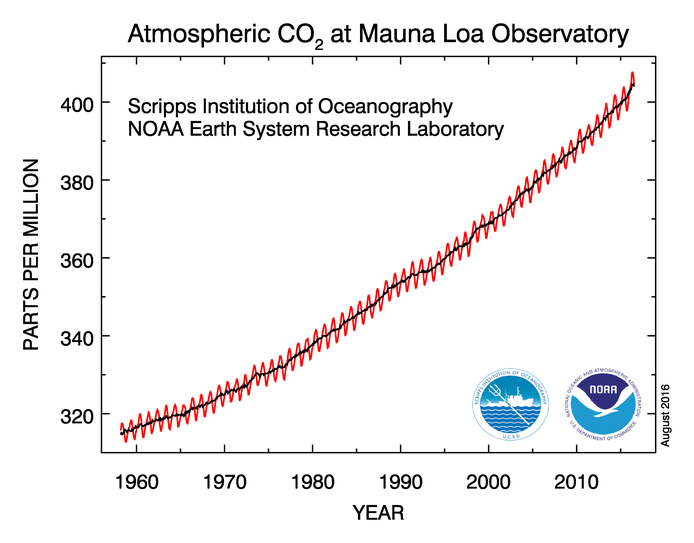 In fact, the growth rate of CO2 concentrations is increasing. We need to do more. Much more. 1. Establish a 25 dollar per ton tax on carbon emissions associated with fossil fuels. 2. Reduce the sales tax by a full percent. 4. 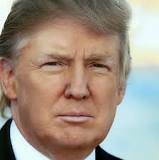 Lower the Business & Occupation tax on manufacturing to 0.001 percent of gross receipts, effectively eliminating the tax. 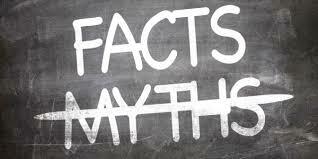 I-732 is designed to be revenue neutral, so that the money collected by the carbon tax is used to reduce other taxes. Government will not grow as a result. 1. It taxes what we don't want, and lets the market decide on the best approach to reducing CO2 emissions. Much more effective than government micromanaging the economy or deciding winner/losers. Folks on both sides of the aisle support this approach. 2. It will reform the Washington State tax structure, one of the most regressive in the nation (no income tax, high sales tax), making it less onerous for low-income folks. 3. It will essentially eliminate the Business and Occupation tax on manufactures, which is a real burden to small and upcoming businesses. I-732 would be the first bipartisan effort in the nation for addressing global warming from fossil fuels through a carbon tax. It would be an influential example to the nation, showing that all sides of the political spectrum can work together to address a major environmental threat. Environmentally minded conservative folks like I-732 because it lets the free market decide on how to solve the problem, while not putting a net tax on society. Government doesn't grow. Environmentally minded liberal folks like I-732 because it deals with carbon pollution, while making our tax system less regressive. Everyone wins. Democrats and Republicans, include a number of major regional politicians, support I-732, as do free-market thinkers like Todd Myers of the Washington Policy Center. Recently, environmental policy experts at the Sightline Institute concluded that "I-732 would launch Washington to a position of global leadership on climate action." The list of supporters of I-732 is long and deep, including major local leaders such as Congressman Jim McDermott, Mike McGinn, Ron Sims, Republican State Senators such as Mark Miloscia and Steve Litzow, environmental groups such as the Audubon Society and the Olympic Climate Alliance. And many more. Unfortunately, there are some folks, generally on the far right and left, that don't support I-732. Hopefully, reflection and facts will change their minds. Why are some folks against I-732? Some on the conservative side of the political spectrum don't believe that global warming is a threat and that humans could not possibly have a significant impact on the global atmosphere. Their conclusions are wrong and are contradicted by the best science. order to make U.S. manufacturing non-competitive"
Others worry about the impact on business, particularly heavy energy users. These include the Association of Washington Businesses, the Washington Truckers Association, some of the pulp and paper manufacturers, and a few farm groups. These groups are mistaken. 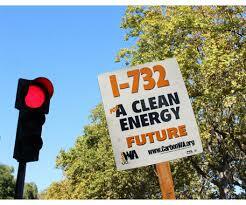 I-732 is BOTH pro-environment and pro-business. It offers predictability for energy costs, without government intervention. Economic analysis by Regional Economic Models, Inc. (REMI) found that by 2020 Washington, I-732 would stimulate a net increase of over 15,000 jobs, and an enhancement in WA annual GDP of over $500 million. The state Office of Financial Management also projects that I-732 will increase retail sales and other business activity. I-732 essentially removes the B & O tax for manufacturers and there is a 40-year phase for taxes on agricultural fuels. In short, I-732 will be good for business. There are those on the left side of the spectrum, who oppose I-732 because it is revenue neutral. These folks have nothing against a carbon tax but they reject revenue neutrality. They want to use the revenue from a carbon tax for government programs (such as supporting renewable energy efforts) and to assist low-income folks, who they believe are preferentially hit by climate change. But there are problems with their approach. Government has a very poor track record in supporting winners and losers in the energy sector (consider the 500 million lost by supporting solar cell manufacturer Solyndra). More seriously, removing revenue neutrality will undermine the ability of the measure to be bi-partisan (it would destroy support by Republicans and conservatives). There is no way major progress can be made on reducing greenhouse gases in the U.S. without the support of both Democrats and Republicans. Furthermore, there is little evidence that greenhouse gas warming is preferentially hurting low-income folks in WA State, and, in any case, I-732 will reduce the sales tax and provide a working families rebate that will greatly aid low-income individuals and families. A major failure, costing half a billion dollars, that should not be repeated. In short, the "progressive" and "left-leaning" folks opposed to I-732 should reconsider the issue and understand that I-732 supports their environmental and social agenda, while dealing with the issues of others on the political spectrum. Groups that need to reconsider their opposition include some labor groups, social actions groups such as the "Alliance for Jobs and Energy" and the Sierra Club. Governor Inslee, who says he is passionate about dealing with climate change, needs to get on board (the Democratic party is split on this issue). They need to decide whether their top priority is to protect the environment or grow government. They can't have both. 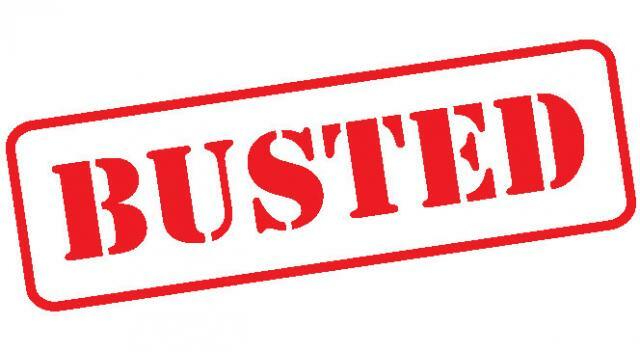 There are those who oppose I-732 because an initial analysis by the WA State Office of Financial Management concluded that the initiative would reduce state income by about $200 million a year. This is a red herring. First, this estimate is based on false assumptions and is incorrect. But even if they were correct, this amount is nearly in the noise level (less than 1% of the state annual budget) and corrections could easily be made by the state legislature. Finally, there are those who say "why bother"? Washington State is only a small part of the problem, they suggest. We are already fairly energy efficient because of massive hydro resources. My answer to this (reasonable) question? Everyone is a small part of the problem and thus everyone needs to act. Only if everyone does their part (in reducing carbon emissions) can we make real progress in dealing with global warming. This is related to the well-known concept of the tragedy of the commons. Our effort will be an example to the nation and hopefully will stimulate progress towards a national carbon tax, which could have a MUCH larger impact. And folks around the world look to the U.S. for leadership; thus, our progress could have global impacts. I-732 would represent a bipartisan effort, thus demonstrating that folks of all political beliefs can work together for critical environmental needs. It has happened before (the bipartisan Clean Air Act of the 70s). It could happen again. The U.S. has proven time and again that we can do amazing things when we work together (like travel to the moon). 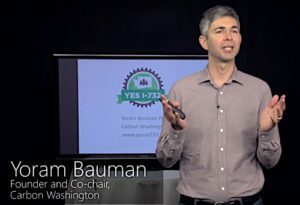 In summary, I-732 is a chance for citizens of Washington State to make a meaningful step towards reducing carbon emissions, will make our State tax system fairer and less regressive, will foster business and economic activity, and will serve as a positive example to the nation of environmentally effective bipartisan action. On September 28, I will be giving talk in Seattle on the Climate Surprise: Unexpected Climate Impacts of Global Warming on the Pacific Northwest. I will review the latest research and describe some regional "climate surprises" that may well occur. This talk will be sponsored by CarbonWa, the organization behind I-732, and will be a fundraiser for their efforts this fall. To find out more or to secure tickets, please go here or here (http://yeson732.org/uw/). There is both general admission seating ($20) and an opportunity to help further ($ 100, with a wine and cheese reception before). Of course, even bigger donations would be very welcome and helpful.